Andreas lives in Stockholm, Sweden. He grew up on the wrestling mat, fighting other little boys in leotards. He won most of the time since he’s always given 100% in everything that he does. He also played the violin in an orchestra during his childhood. You might not think classical music and wrestling has much in common with Swing dancing, but it has definitely contributed to him becoming the unpredictable, creative, musical and interesting dancer he is today. Andreas was introduced to Lindy Hop in 2001 and a few years later to Balboa. Andreas teaches dance because he loves to see students learn and improve. As Andreas sees it, teaching is inspiring since it offers a possibility to contribute to the ever-changing dance style and scene. 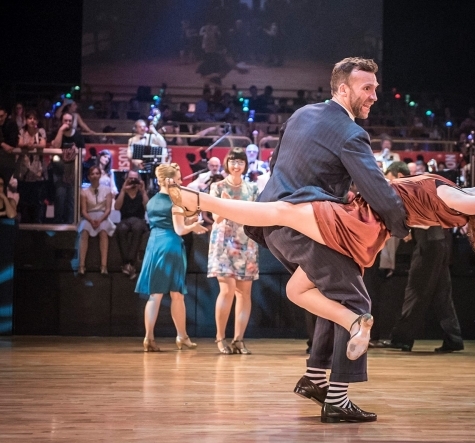 He has been placed in a number of prestigious competitions in both Lindy Hop and Balboa around the world with a number of well known swing dancers. He is also a history lover and one of the very few marine archaeologists in the world. Ask him about the ”Vasaship” or ”Vikingships”. Olga was born into a family of teachers (language and music) and since early years has been an energetic live wire – studying music, doing athletics, martial arts and gymnastics. In 2007 she was introduced to Lindy Hop and this is where the real passion story begins. She got dance hooked and started to explore more of the dance world by getting into Blues and later Balboa. She has been actively travelling the globe in pursuit of more opportunities to dance, learn and compete. Later she began to share her love for swing music and dance by teaching. At her classes Olga pays a lot of attention to getting the students interested and involved by giving challenging and fun tasks, working both on technique and musicality and infecting them even more with the passion for dancing.